The NHL’s scheduling genius’ in Toronto struck once again Saturday as the Capitals made their second trip to Ottawa in the last seven days. The Capitals made fairly easy work of their first visit last Saturday, blanking the Sens 4-0, with Pheonix Copley pitching the shutout. This Saturday, the game seemed to be following a similar path, but a late rally by the Sens made it close, with the Caps prevailing 3-2. 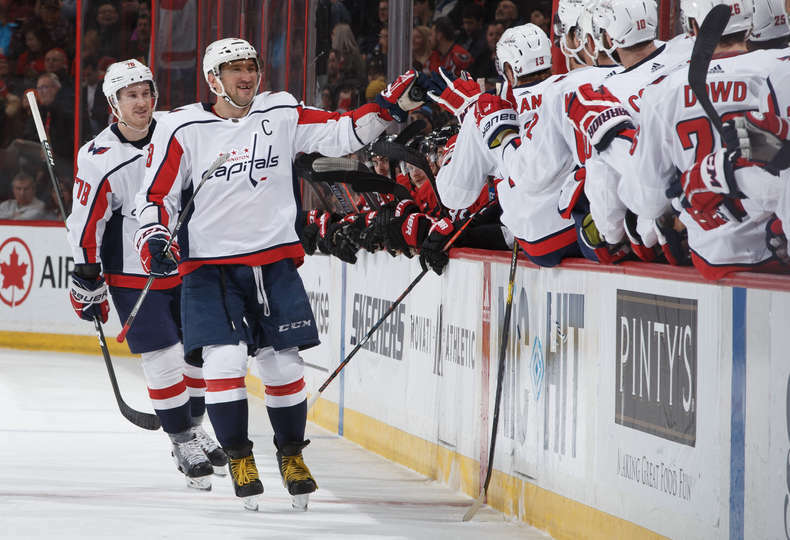 The Capitals are back in action on Monday when they host the Nashville Predators at Capital One Arena. Puck drop is set for 12:30 PM. The Capitals opened the scoring with a goal from Tom Wilson at 7:12 of the opening frame. The goal was setup by a nice centering pass from Evgeny Kuznetsov, finding Wilson on the doorstep. Tyler Lewington would score his first NHL goal to make it 2-0 at the first intermission. Madison Bowey would get in on the “firsts” with a tally early in the second period, his first NHL goal as well, for a 3-0 Caps lead. The Sens would get on the scoreboard later in the period for a 3-1 Caps lead at the second intermission. The Sens would add another goal in the final frame to make it close, but the Caps held on for the 3-2 win. Matt Niskanen, who took a wicked spill into the boards in the Caps last game, tried to give it a go in morning skate on Saturday, but wasn’t quite ready to return to the lineup. As a result, Tyler Lewington drew into the lineup. Scratches: Matt Niskanen (injury), Travis Boyd and Dmitrij Jaskin. The Capitals did well in shots up until midway through the middle frame. 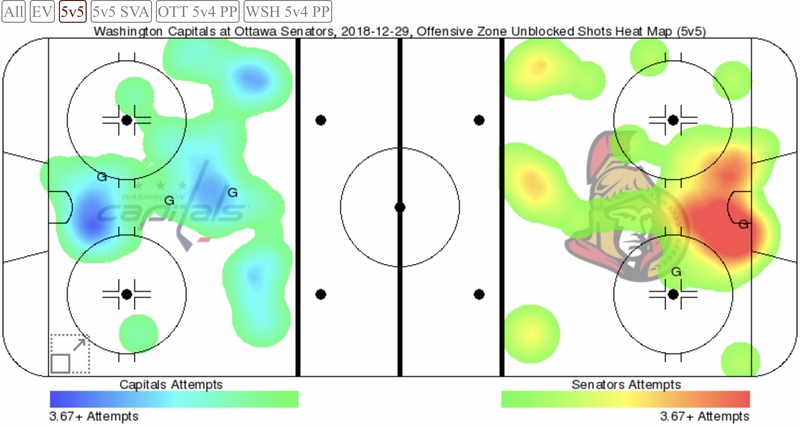 After scoring their first tally, the Sens began to generate a lot more shots, and ultimately out-attempted the Caps 60-49 for the game, and led 33-24 in shots on goal for the game. Pheonix Copley was strong once again in goal, stopping 31 of 33 shots for a .939 save percentage, and his second win in Ottawa in a week. Marcus Hogberg, making his first ever NHL start, stopped 21 of 24 for an .875 save percentage. 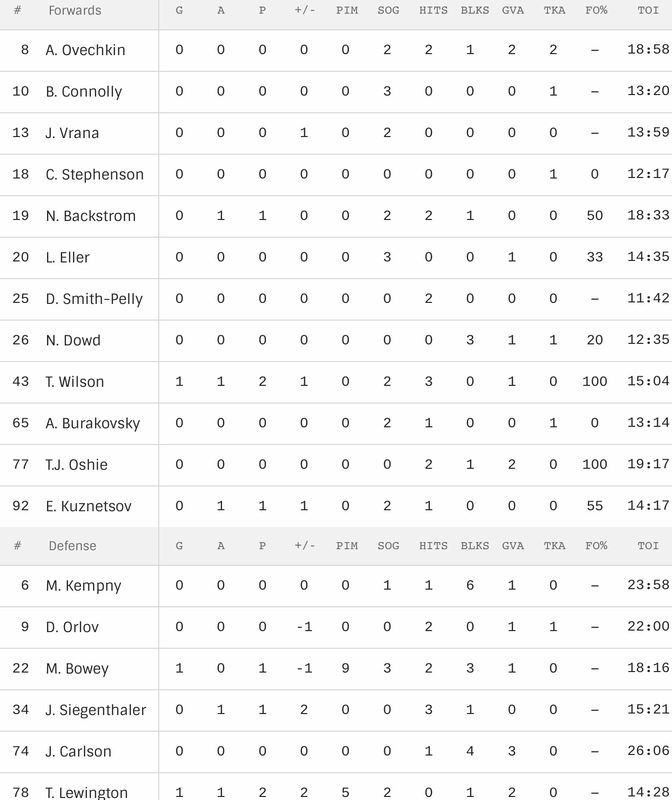 The Senators were 0 for 1 on the power play. The Capitals did not have a power play in the game. The Sentators won the faceoff battle 57-43%. Chandler Stephenson was 0 for 1, Nicklas Backstrom was 10 for 20, Lars Eller was 5 for 15, Nic Dowd was 1 for 5, Tom Wilson was 1 for 1, Andre Burakovsky was 0 for 2, T.J. Oshie was 1 for 1 and Evgeny Kuznetsov was 6 for 15 at the dot. Tyler Lewington recorded a Gordie Howe hat trick, (goal, assist and fight). Madison Bowey scored his first NHL goal. Tonight marks the first time in #Caps franchise history and the 19th time in NHL history that two defensemen from same team have both scored their first NHL goals in same game. Tom Wilson scores the Capitals first goal with his 11th goal in his 18th game. He’s tied for second on the Capitals in goals, and he’s recorded a point in 13 of his 18 games this season. With his assist on Lewington’s first-period goal, #Caps center Nicklas Backstrom has tied Henrik Zetterberg (623) for eighth all-time in assists among Swedish-born players. Peter Forsberg (636) is his next target, and Nicklas Lidstrom (878) is the all-time leader. This entry was posted in News and tagged Jon Sorensen, Madison Bowey, Ottawa Senators, Pheonix Copley, Tom Wilson, Tyler Lewington, Washington Capitals. Bookmark the permalink.